A person may experience bone loss for a variety of reasons, including tooth loss, gum disease, or trauma. Bone retention is important to maintaining overall facial structure and oral health. Healthy bone structure is essential to some dental procedures also, such as dental implants. A bone grafting procedure is an option to restore bone where it has been lost. Patients should choose a provider carefully who will evaluate overall oral health, be able to make proper recommendations, and perform procedures necessary to restore oral health. Dr. Sanda Moldovan is a dentist and periodontist providing outstanding treatment to patients in and around Beverly Hills, CA. As a periodontist, she specializes in the supporting tissues of the teeth, and has an extensive education in gum disease and its treatments. 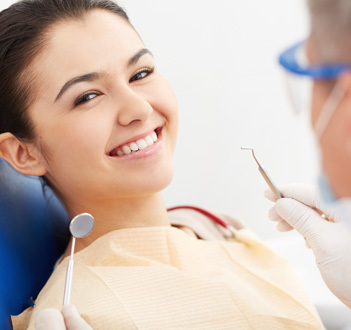 Gum disease is best diagnosed and treated in its earliest stages. Left untreated, the initial form, called gingivitis, can progress to periodontitis. Complications from gum disease will eventually lead to tooth loss and deterioration of bone structure. With regenerative surgery, or bone grafting, tissues lost to gum disease can be restored. This leads to a better overall outcome for the patient. Patients with gum disease may need to undergo a treatment known as scaling and root planing. This removes harmful bacteria, plaque and tartar, and prepares the teeth for easier maintenance. Dr. Moldovan performs the grafting procedure by accessing the roots of the teeth and the bone beneath the gums, and fills in any areas of bone loss. There are various materials that may be used for this purpose. Barriers are then placed to ensure proper healing. Gums are attached back into place and allowed to heal. Following this treatment, the patient's bone and gums will undergo a natural rebuilding process, restoring health to the patient's oral structure, and providing a strong foundation for their teeth. Proper hygiene is essential to oral care, and especially important following oral surgery. The mouth is the breeding ground of many bacteria, but careful attention can be most effective. Dr. Moldovan and her dedicated team desire a comfortable and successful experience for each patient. Routine care visits will allow careful monitoring of patient health and prompt treatment of any problems. This preventative care can help the patient avoid many complex procedures. Should you find yourself in need of periodontal treatment, you will be in highly skilled hands. Call today to schedule your next cleaning and exam to keep your mouth and gums healthy – because healthy is beautiful.